Marshall Goldsmith is the leading executive coach in the world and the author of the New York Times bestsellers What Got You Here Won’t Get You There and Mojo. He received his PhD from UCLA Anderson School of Management. His client list is a who’s who of American CEOs. He and his wife live in San Diego. "Triggers provides the self awareness you need to create your own world, rather than being created by the world around you." "Reading Triggers is like talking with Marshall. You get clear, practical, and actionable suggestions." 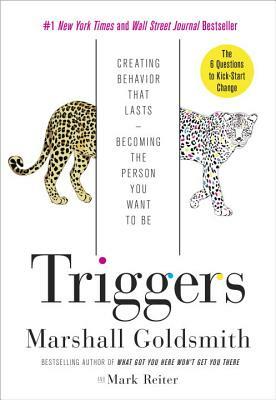 "Triggers inspires us to be better people, better leaders, better fellow travelers. 'Creating behavior' is our new battle cry for a bright future." "Marshall is a valuable coach and partner in driving organizational change and performance improvement. Triggers will guide a new group of executives looking to reach their full business and personal potential." "Marshall Goldsmith is one of the world's foremost experts at helping people get better. In this new book, he provides a rich set of new, practical, life tested ideas, concepts and frameworks that will help those of us who want to change, be the best that we can be, and be the person we want to be." “Marshall Goldsmith is a great author and world-renowned executive coach. His contribution to our group has been immense and we have greatly benefited by his unparalleled experience and his knowledge. In Triggers he shares illuminating stories from his work with great global leaders. He helps us transform our lives and helps us become more holistic human beings. This is a book worth reading for every practicing professional and for those who aspire to leadership. --Nils Lommerin -- President & CEO, Del Monte Foods, Inc.
--Mark Thompson – New York Times bestselling author of Admired, Success Built to Last and Now, Build a Great Business! “Marshall and Mark have done it again!!! They have “done their best” to prepare insightful, useful, and practical tips to ensure sustainable behavioral change. Reading this book feels like having Marshall “knee to knee” coaching me. What a privilege to learn from his insights, savor his stories, and fully engage in positive personal change. Marshall is truly a gift to all of us who want to get better.